What's Next For Gold Owners? Do you already own gold, silver and other precious metals and wonder what the next step might be to strengthen your portfolio? Are you so concerned with the state of the precious metals market that you are not able to make an investment choice, one way or the other? Are you looking for a safer, less volatile and more diverse investment in precious metals? If so, our Rare Coin Program (RCP) may be just the thing for you. Investment grade rare coins are uncorrelated to any other market, to include gold and silver. They are above the fray of most economic influencers. And pricing is dependent upon collector demand. All of these factors make rare coins one of the least volatile assets you can own. U.S. rare coin values rose in 2008 while the market was hurting. Rare coins have been an impressive growth investment. The 2015 Knight Frank Luxury index reported a price increase for rare coins of 10% in the last 12 months, 91% in the last 5 years, and 227% in the last 10 years. 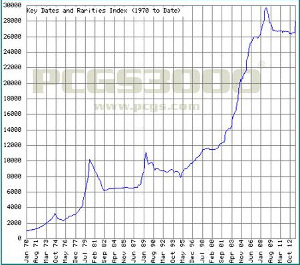 Rare coins have gained an average of 11% per annum over the last 40 years, outperforming the stock market. While much of the rare coin headlines have been garnered by the recent sale of million dollar coins, there are similar percentage gains to be made from mid-level coins as well. The ASI RCP has offered so many high value coins at affordable prices, it has become one of ASI's most popular rarities programs. Below are some of the excellent choices we have for you now. The 1804 Small 8 is an issue which is relatively available by the standards of the Capped Bust Right half eagle series but it is most often seen in EF and AU grades. Low end Uncirculated examples are available but this date becomes rare in properly graded M63 and it is very rare above this as evidenced by the fact that PCGS has graded just three coins higher than this including the MS64 Pogue example. This fresh-to-the-market example has not been available since the early 1990′s and it has an appearance which is not often seen in today’s strip-n-dip environment. The luster literally dances upon the vivid yellow-gold surfaces and a band of deeper reddish color at the obverse border offers nice contrast. The strike is very sharp and there are only a few small ticks seen on the surfaces. In my opinion, this coin would not look silly in a 64 holder and the only thing keeping PCGS from doing this, I suppose, is a small contact mark on the cheek of Liberty. No PCGS MS63 1804 Small 8 half eagle has sold at auction since January 2009 and only two PCGS MS63′s have sold since July 2005. A non-CAC PCGS MS64 brought $51,750 in the Goldberg 5/08 sale and it is likely that if one were available, a PCGS MS64 with CAC approval might bring north of $60,000. This is the only PCGS MS63+ of this date graded by PCGS and only three have been graded finer, all in MS64. A very important coin for the early half eagle specialist or for the type collector who wants to own a single exceptional Capped Bust Right half eagle. Insiders see a new chapter for the rare coin market… and so does ASI. The majority of investment grade rare coins are sold at auction and at coin shows. 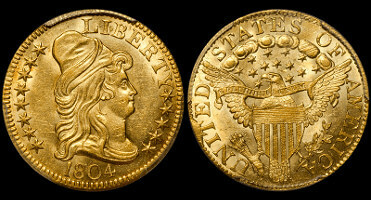 Our Rare Tangible Asset experts, Doug Winter (the world’s leading expert in pre-1933 U.S. rare gold coins), and Stanley Gibbons, Ltd. (the world’s leading experts on rare stamps and world coins), reported that until recently, activity at many coin shows were below the usual transaction pace of past shows. There was simply too much focus on high dollar sales. With coins selling for $1 million or more monopolizing media coverage, mid-level investors had been turned off. Many stopped attending the most important shows. Trading became less active. In turn, collectors did not sell, but held tight, leaving inventory sparse and disappointing. The Spring 2015 Whitman Coin & Collectibles Expo was held in Baltimore, Maryland on March, 26-29. Our insiders agree vigorous buying and selling of more affordable options has returned. Many dealers reported better than anticipated sales and a back-to-normal buying and selling pace for mid-priced coins. The RCP currently has access to value inventory at prices very much affordable to you. The Baltimore show displayed heavy U.S. participation. We know the trend is mirrored in other active markets like Asia and Europe, with demand slated to increase. Your rare coin portfolio can start with a single coin, or several. You can add to your holdings at any time. And, ASI won’t abandon you once you buy. We remain with you every step of the way, and we hope to assist you when it comes time to sell as well. Of course, you are always free to sell at auction or to a private dealer. The RCP includes only truly rare coins. Condition, design, rarity and collector desirability are all carefully considered before any coin is selected for you. All RCP coins have the guarantees of the renowned third-party standardized grading services (PCGS or NGC) used to authenticate and verify their condition. Moreover, it is Doug Winter who hand picks your coins. Doug has access to undervalued coins, special sales, and a clear understanding to what collectors are looking for at any given time. Doug brings a lifetime of expertise to bear on your behalf. Call an ASI Preferred Client Relations representative and take the next step beyond precious metals and into rare coins. Not surprisingly, the RCP is one of ASI's most popular programs. It is an easy next step; but, an essential one given the uncertainties of our markets today and the need for portfolio balance to achieve wealth protection. Call us at 877-340-0790 or send me an email to arrange a time to talk about the pre-1933 U.S. rare gold coins we have available in the RCP. I look forward to helping you Keep What’s Yours through rare coins.